Kakuni (角煮) is a Japanese braised pork dish which literally means "square simmered". Kakuni is a popular regional product (meibutsu) of Kyushu, particularly Nagasaki. The origin of this dish is most likely Chinese, making it a form of Japanese Chinese cuisine, and it is similar to Dongpo pork, though not as heavy in sauce. During the Ming Dynasty and Song Dynasty, the main Sino-Japanese trading route existed between Hangzhou and Kyūshū. Many Chinese lived in major port cities in Kyushu, such as Nagasaki; likewise many Japanese lived in Hangzhou. Therefore, pork was popularized in major Kyushu cities. The Okinawan regional variation is called Rafute. 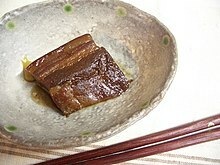 Kakuni is made of thick cubes of pork belly simmered in dashi, soy sauce, mirin, sugar, and sake. By cooking it for a long time over a low temperature the collagen breaks-down into gelatin keeping the meat moist while becoming extremely tender allowing it to be consumed with chopsticks easily. The dish is often served with scallions, daikon and karashi. ^ a b c Liaw, Adam. 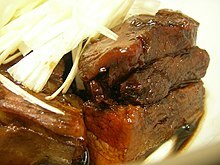 "Nagasaki-style red-braised pork belly (buta kakuni)". Retrieved 16 February 2017. Wikimedia Commons has media related to Kakuni. This page was last edited on 8 December 2018, at 19:31 (UTC).